Programming with FASM – test with CPUID . First you need to take a look at this website. The CPUID returns processor identification and feature information in the EAX, EBX, ECX, and EDX registers. What the source code from my example do ? First I start with the default assembly program . The next step is to strat with reset xor eax,eax use cpuid. The result of CPUID will be put into EBX. Into section ‘.data’ data readable writeable make a structure named out_buffer. 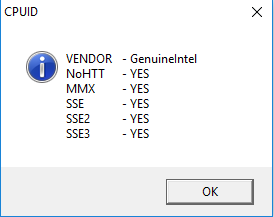 mov [out_buffer.vendor_ebx],ebx will give us “Genu”. Because I used MessageBox to show us the out_buffer. The result will be : No or Yes with the size of dd. The db can define byte variables, as well as arrays of bytes. Fasm documentation tell us: For example db 1,2,3 will define the three bytes of values 1, 2 and 3 respectively. The dd has 4 bytes. The result will be this text (the result is true so the text will be YES): “NoHTT – YES”.